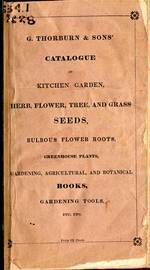 Catalogue of Kitchen Garden, Herb, Flower, Tree, and Grass Seeds, Bulbous Flower Roots, Greenhouse Plants, Gardening, Agricultural and Botanical Books, Gardening Tools, etc. 1830. Unlike simple price lists, Thorburn’s catalogues incorporated many elements of popular gardeners’ calendars and gardening books. The table of contents shows the categories of plants he sold in 1832. After each list of varieties, he gave cultural instructions. 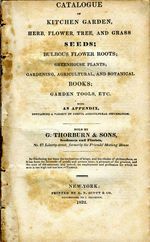 Thorburn quoted liberally from English gardening authorities including Loudon, but added his own notes on how plants performed in America. The catalogues contained prices for all items except agricultural or farming seeds, which had variable prices. Mail-order and shipping were not explicitly mentioned; however, Thorburn offered “Native American Tree Shrub and Plant Seeds, suitable for sending to Europe”, along with a note that “Orders should be sent during the months of November, December and January”. Also, “orders for bulbous roots should be forwarded from September to December, inclusive.” The contents page shows that Thorburn also mentioned a wholesale price list for dealers to be “obtained on application; or the seeds neatly put up in six-cent papers, labeled and sealed ready for retail”. Independent traders and agents of seed and nursery companies played an important role in conveying seeds and plants to customers in remote areas in the days before reliable mail order. The “esculent vegetable” section included all vegetable seeds, unlike many English and earlier American lists which listed peas and beans, as well as root vegetables in separate sections. Although traditional English staples such as cabbage, peas and turnips predominated in terms of number of varieties of each, a great diversity of vegetables is represented.5 Thorburn’s list would look respectable in gourmet salad catalogues of today, with corn salad, roquette (arugula), scorzonera and skirret, and four varieties of endive. Corn is listed as Indian Corn, and Thorburn’s list demonstrates that many American settlers still considered it to be a novelty; several variety names included the adjective “curious”. Sweet corn was not yet as popular as it became in the second half of the 19th c., but Thorburn recommends it as “best for boiling”. While English catalogues contained more broad beans, Thorburn stocked a good selection of pole and bush beans, including the ‘Refugee’ or ‘Thousand to One’ bush snap bean, which is still available. Thorburn offered only one red tomato, although M’Mahon of Philadelphia listed a yellow variety in 1805 and William Booth of Baltimore offered a white one in 1810. Thorburn, however, provides two recipes for tomato relish, at a time when tomatoes were rapidly becoming popular at American markets. Thorburn also suggested an assortment of vegetables, as well as several herbs and flowers for a one-acre garden, in both English and French (possibly intended for Canadian customers). Thorburn’s flower section includes annuals, biennials and perennials, bulbs, greenhouse plants and herbaceous plants, some of which were “imported at great risk and expense”. Thorburn listed a huge selection of recently introduced dahlia varieties, supposedly every known chrysanthemum variety, and six sweet peas, including a striped one. Thorburn gave space in his catalogue to an idea often touted in garden literature of the early 1800’s-- the encouragement of gardening as a desirable and suitable occupation for ladies. It was considered proper, if a woman could afford it, to stay at home. To occupy her time with botany was thought to be an edifying activity that would improve the health, well-being, and perhaps even the temperance of her family members by providing a beautiful and cultivated home that would be preferable to a tavern. Thorburn provided instructions for making herbaria, with the remark that this would be a better use of ladies’ time than compiling sentimental scrapbooks. All the same, the last four pages of the catalogue translate the language of flowers, with which ladies could convey secret messages in their bouquets. Pressing flowers, flower drawing and botany infused with sentiment were popular hobbies of nineteenth-century middle-class ladies, and the catalogue clearly addressed this market. Like many seed merchants throughout history, Thorburn did not make his living exclusively from selling seeds; he also sold more expensive items such as plants, tools, and books. He also included canary birds, mignonette pots and, “crocus pots, in the form of Bee-hives, Hedge-Hogs, Flower-Baskets, Pyramids, &c. for blowing Crocus Roots in the parlour or green-house”, these being fashionable indoor gardening accessories. Neither a copy of the G. Thorburn catalogue of 1822 in the National Agricultural Library collection nor the catalogue of 1828 in the University of Delaware collection have illustrations, although they have decorative borders on the covers. The catalogue of 1821 had an illustration of a greenhouse on the cover and title page. This catalogue is held at the Library of Congress. Grant Thorburn, Forty Years Residence in America, or, The doctrine of a particular Providence exemplified in the life of Grant Thorburn (London, James Fraser, 1834) 96. Thorburn’s second autobiography is Life and Writings of Grant Thorburn, New York, Edward Walker, 1852. The 1817 edition of his gardener’s calendar, first published in 1812, is available on microfiche: Grant Thorburn, The Gentleman and Gardener’s Kalendar for the Middle States of North America, microfiche, New Canaan, CT: Readex Microprint 11x15 cm., Early American Imprints, Second Series, 42288. John Galt, Lawrie Todd, or The Settlers in the Woods (New York, J&J Harper, 1830). Much of the first volume of this novel was transcribed from the manuscript of Thorburn’s biography. Thorburn does not describe the vegetables in detail. Many of the varieties he sold were described in Fearing Burr’s Field and Garden Vegetables (Boston, Crosby & Nichols, 1863) and The Vegetable Garden by M.M. Vilmorin-Andrieux (Paris, 1885, first issued in French as Description des Plantes Potagères in 1856), as well as Thomas Bridgeman's The Young Gardener's Assistant (published at least as early as 1845). Brief vegetable descriptions can also be found in Robert Buist, The Family Kitchen Gardener (New York, J.C. Riker, 1847).